In Paul‘s first letter to Timothy, he goes deeply into the topic of false teaching and warns the young Timothy against it when trying to guide his congregation in the doctrine. In 1 Timothy chapter 6, Paul warns against those church leaders with false doctrines, who view godliness as a means to financial gain. If the purpose to worship God is for money, or for anything else, the doctrine is severely flawed. 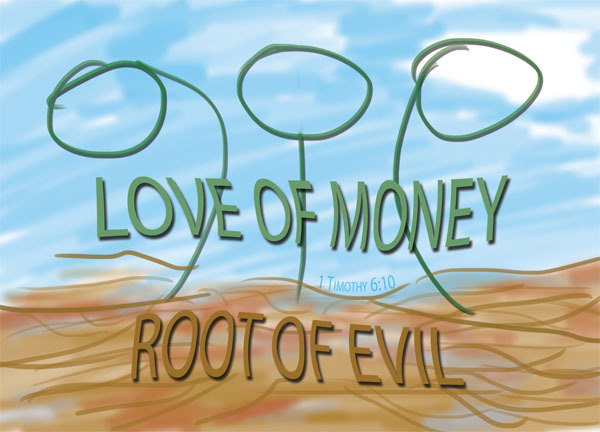 With 1 Tim 6:10, Paul further explains how the love of money will lead to sin. Do you love money? You probably do, as money is a necessity in order to fulfil the most basic of our needs. you probably wouldn’t mind earning more money. You will probably rejoice and shout out ‘Hallelujah!’ on receiving a fat bonus for Christmas. That’s probably loving money. And that’s probably not what Paul was referring to here. The love of money here probably refers to a deep, insatiable lust for wealth and riches that leads to one straying from God. A love of money that would, for 30 silver coins [Matt 26:15], make Judas betray Christ. A love of money that would, for just a portion of the profit from the sale of the land [Acts 5:2], cause Ananias and Sapphira to lie to the apostles. Money isn’t evil. The love of money that would lead to men straying from God is evil. It leads to sins. By faith, we are told that we do not need to worry about our needs, for God will supply them [1 Tim 6:7]. No one can serve two masters; for either he will hate the one and love the other, or he will hold to one and despise the other. You cannot serve God and Money. [Matthew 6:24] We cannot serve both God and Money. The Love of Money will keep us from serving our Lord. It weakens our faith, and causes us to lose sight of God. As in the case of Ananias, what was meant to be an act of charity, generosity and kindness became an act of selfishness and sin, because he thought about the money, and wanted to keep some of it himself. Could he not have kept some of that money to himself? Was that a sin? No, it wasn’t a sin, as Paul mentioned in Acts 5:4 – as the money was his. His sin was lying to the apostles in a bid to keep up the show of generosity. His overwhelming love for money caused him to lose sight of the right thing to do. His faith collapsed, and he paid for it in blood. People who want to get rich fall into temptation and a trap and into many foolish and harmful desires that plunge men into ruin and destruction [1 Tim 6:9]. The allure of wealth is undoubted, as wealth ensures financial security, which, especially in modern days, in turn ensure a certain degree of health stability, family stability, and luxury. Judas ended up overwhelmed with guilt and grief and committed suicide [Matt 27:5]. Ananias and Sapphira were struck dead on the spot upon lying. Harsh, really, really harsh. If we place our trust not in Money but in our Lord; if we serve not Money but God, we will learn to have peace, joy and hope even in poor and dire times. If we place our trust not in Money but in our Lord, if we serve not Money but God, we will learn to have peace, joy and hope even in rich and blessed times. Poor but happy is a romantic ideal, but true happiness is possible for both the rich and the poor, if their eyes are set on the Lord. The Lord gave and the Lord has taken away [Job 1:21] – you may be rich today, but don’t ever forget that the wealth that you hold onto so much can one day be taken away from you. A good relationship with the Lord when you are rich and a good understanding of wealth being but just a worldly asset that does not translate itself into eternity will see you through times of poverty. A good relationship with the Lord when you are poor and a good understanding of wealth being but just a worldly asset that does not translate itself into eternity will see you through times of wealth. How important is money to you? Is it more important than your family, more important than life, more important than God? Love money, but do so not without God; do so with the faith that God will provide for your needs. Do so with a joy that remembers the Lord. If you give, do not give for the sake of giving like Ananias, who was a copycat of Barnabas, but give sincerely and cheerfully [Romans 12:8]. If you are rich, ask yourself if you are able to give to the needy as Jesus commanded [Matthew 5:42]; ask yourself if you are able to go, sell your possessions and give to the poor and follow Christ [Matthew 19:21]. If you are poor, take heart for God will maintain justice for you [Psalm 140:12], persevere and not fall into sin and temptation because God will not forsake you [Isaiah 41:17] and have faith because you are blessed with peace, contentment and joy [Luke 6:20-21]. If you are neither rich or poor, reflect on the words of Solomon in Proverbs 30:8-9 – give me neither poverty nor riches, but give me only my daily bread. Otherwise, I may have too much and disown you and say, ‘Who is the LORD?’ Or I may become poor and steal, and so dishonor the name of my God. Professors of faith have generally been poor, but many have been rich – Job was an example of a man of faith and hence blessed with great wealth. Whether you are rich or poor, the temptations of money are great. In a world that values everything by its monetary worth, let us stay strong in faith and let not our eyes be swayed by the allure of wealth, whether through legal means or through dubious means. I tried to hit the like button but it would not let me so I will say “like” here. great post! as a Christian, you’re teaching me lessons from the Bible I’ve already read yet I always learn something new, vital, important every day. You are truly Anointed to spread the Word of God in a way that all people can understand..God is well pleased ! Thank you dear zecqi for helping me learn & grow! Excellent! Thank you for sharing brother. Must follow 🙂 You are annointed.